The person who never stops training? The one who tries to outwork the competition? Or, from a health perspective, which increases injury risk? Overtraining or undertraining? Answer – both. Working way too hard is just as bad as not working hard enough. *Note- we’re talking about non-contact, overuse injuries here. These are preventable. Contact injuries are a different story. We don’t have as much control over what happens when two players collide on the soccer field or basketball court. The best sports performance programs aim for a “sweet spot” where training is intense enough to make athletes better, faster, stronger… but not so crazy that it causes injury (which would clearly not help those goals). Think of acute training like “fatigue” – how tired are you from your training sessions or workouts over the past week? Chronic training is basically looking back on the past few weeks and reflecting on “how fit you are” overall from those workouts. Objectively comparing how you feel now to how you have felt over the past 3-6 weeks gives interesting data on how ready you are for competition. Let’s use running as an example. If an athlete has taken it easy the week before a race but has a good base of mileage in previous weeks, they are ready to run. Their acute training would be classified as low (not tired, well rested) but their average chronic training is high (they built a base of endurance over the past few weeks). I coach a distance running program through my local running store. We prepare runners for half and full marathons over the course of a 15 week training cycle. The training program hits peak mileage 11 weeks before race day. The last couple weeks leading up to the race are “taper” weeks designed to decrease the acute training load on our runners. The goal is to feel fresh-legged at the starting line but still have the capacity to run either 13.1 or 26.2 miles. Taper weeks are always a source of stress for our runners who worry they’ve not run high mileage during that time, but as you can see, there is scientific data backing our recommendations to taper. All these factors are important in determining the effect of a given workout. The same external load could have a different internal effects based on the individual- think about how a 21-year-old collegiate runner would do on a 4 mile run versus a 40-year-old athlete that started running only a few weeks earlier. The workout is too intense for the 40-year-old but too easy for the 21 year old. The 40 year old would be at risk for injury, where the 21 year old wouldn’t gain any training effect. The same external load could have a different effect on the same athlete as well. Someone could do a workout feeling tired, stressed, or fatigued from a tough week of training. Or they could repeat that workout (same external load) after a great night of sleep or easy week of training. Never underestimate the effect of “life” factors on a workout like emotional disturbances, illness, stress, or recent training history. Respect them and modify workouts accordingly. For endurance athletes like runners, swimmers, and cyclists, this is easy to monitor. GPS watches can log distance and speed covered. Personally, I’ve been using this Garmin model for over a year with great results. Some elite/pro teams are using GPS-based sensors to detect the number of jumps in volleyball, collisions in rugby or football, strokes in swimming, number of sprints per game in soccer. These teams can scale up or scale down training between games based on how much load a particular athlete had in competition. Rating of perceived exertion is one of the easiest ways to track internal training load. Rate the intensity of the session on a scale of 1-10. Multiply that rating by the length of the training session (in minutes). This score could also be called “exertional minutes.” Researchers are still collecting data on different measures of “high” or “low” exertion for various sports. For now we consider a score of 300-500 in football players as a low intensity training session. 700-1000 is higher. Heart rate or VO2max multiplied by training minutes would also be another way to track internal load. Or blood lactate concentration to get really technical (and invasive). There are other scales used for elite athletes like the Recovery-Stress Questionnaire that track mood, stress level, energy, sleep and diet, soreness, etc. The sum of these questions indicates the athlete’s well-being, and coaches or strength and conditioning experts can adjust workouts accordingly. Studies on rugby and Australian Football players show that age influences how athletes respond to conditioning programs. Research also shows older athletes are at higher risk for overuse injuries. But…is the injury risk from workouts that are too intense? Or because older athletes tend to have a greater incidence of prior injuries? History of past injury is a major risk factor for new injury. Regardless, a training program should be individualized to the athlete’s age, experience, injury history, and overall physical capacity. Calculating your own training load. You can use external/internal load and acute/chronic training to decide if you are in the optimal training zone for your goals (or find out are at risk for injury before it’s too late). Research shows the “sweet spot” or optimal zone for training is a ratio between. 0.8 and 1.3. So the runner is in the optimal training zone during the “peak weeks” above, and has built enough of a mileage base to stay in that zone through the taper and entering race week. The same research has also shown us that a ratio above 1.5 is the “danger zone” for training. Increased injury risk is higher in the weeks after training at this kind of load. How many of us have been in this situation? We feel great on a particular training week so we continue to ramp up the intensity. 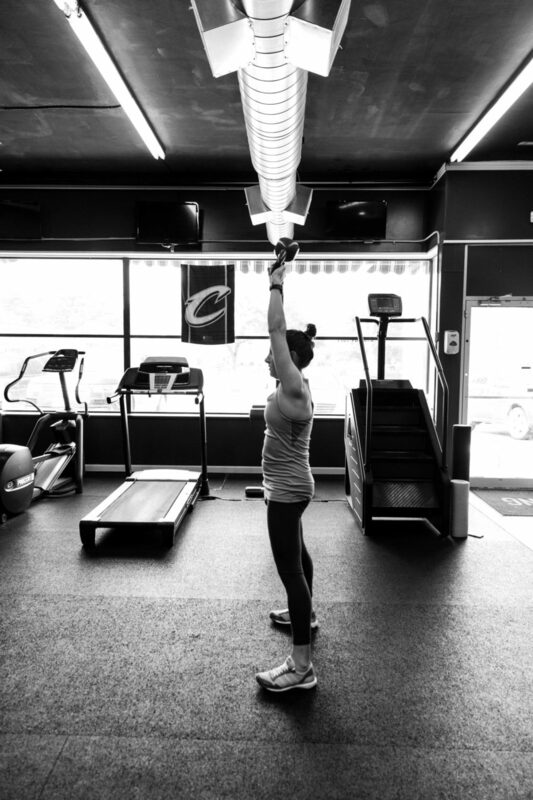 As the workouts get harder, initially we feel invincible… then the wheels fall off. An injury happens “out of nowhere,” leaving us wondering what went wrong. (if I had a dime for every time I’ve heard, “but I felt so GOOD, Carol! I don’t know what happened?!?”). Don’t worry, I’ve made the same mistake too. Many times. Unfortunately this is an easy trap to fall into. Monitoring your acute to chronic load ratio can reduce risk of this happening. But I don’t run. I hate running. I (lift weights, do CrossFit, play soccer, insert sport here…). How do I track my training? Monitor the body’s response to training – the internal training load. Use rate of perceived exertion x number of minutes spent training. Think about other factors – age, stress, sleep, etc. These are important! Banister EW, Calvert TW, Savage MV, et al. A systems model of training for athletic performance. Aust J Sports Med 1975;7:57–61. Blanch P1, Gabbett TJ2. Has the athlete trained enough to return to play safely? 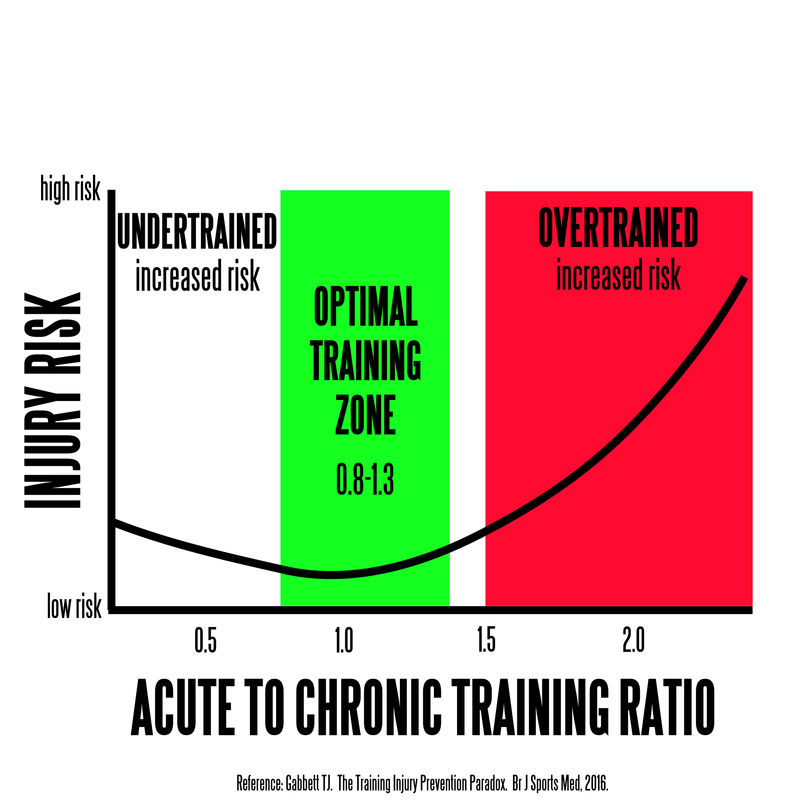 The acute:chronic workload ratio permits clinicians to quantify a player’s risk of subsequent injury. Br J Sports Med. 2016 Apr;50(8):471-5. doi: 10.1136/bjsports-2015-095445. Epub 2015 Dec 23. Bourdon PC, Cardinale M, Murray A, Gastin P, Kellmann M, Varley MC, Gabbett TJ, Coutts AJ, Burgess DJ, Gregson W, Cable NT. Monitoring Athlete Training Loads: Consensus Statement. Int J Sports Physiol Perform. 2017 Apr;12(Suppl 2):S2161-S2170. doi: 10.1123/IJSPP.2017-0208. Gabbett TJ1. The training-injury prevention paradox: should athletes be training smarter and harder? Br J Sports Med. 2016 Mar;50(5):273-80. doi: 10.1136/bjsports-2015-095788. Epub 2016 Jan 12. Fleisig GS, Andrews JR, Cutter GR, et al. Risk of serious injury for young baseball pitchers: a 10-year prospective study. Am J Sports Med 2011;39:253–7.